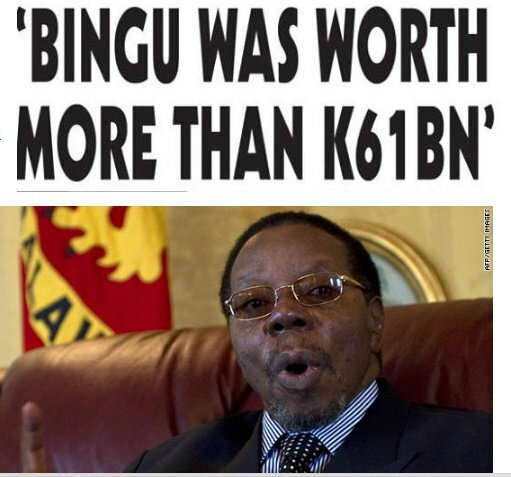 Public Accounts Committee (PAC) of Malawi Parliament has said it will pursue a probe into former president Bingu wa Mutharika’s accumulation of at least K61 billion, alleged to be stashed in offshore accounts. There have allegations made by opposition members who ordered that funds stashed in offshore accounts belonging to the ex-president – part of it was illegally obtained – and should be brought back and utilised towards recovering the country’s ailing economy. Committee vice-chairperson Kamlepo Kalua said his body would summon the Financial Intelligence Unit (FIU), Anti-Corruption Bureau (ACB) and Reserve Bank of Malawi (RBM) once the budget meeting comes to an end. “We will empower these institutions to trace the money to the countries where the accounts are held and then probe the source of that money,” a local daily newspaper, The Nation quoted Kalua as saying. He said the committee wants the three institutions to testify and provide information pertaining to transactions that allegedly took place under their noses between 2004 and 2012. Malawi Law Society (MLS) has already backed calls for a probe into former president Mutharika’s accumulation of at least K61 billion. John Suzi Banda, MLS President, said that citizens of the southern African country had a right to know if money was looted during Mutharika’s tenure as president from 2004 until his sudden death in 2012. “The MPs should deliberate on this issue but parliament has no skills to probe this complex matter probably the police and the [law enforcing egencies] can come in because they have the skills to investigate complex foreign bank accounts,” Banda said. Mzimba West member of Parliament (MP) Harry Mkandawire (People’s Party-PP) raised the issue in the National Assembly last week. “There is money there which belongs to the people of Malawi,” said MP Harry Mkandawire, while presenting copies of a document containing allegations regarding Mutharika’s accumulated wealth. Mkandawire blew the whistle on Portuguese multidisciplinary engineering group Mota Engil that it has been front runners in providing bribes to grease the wheels of government contracts. He highlighted that some of his money was accumulated through inducements from Mota Engil. Mota Engil made separate cheque payments to the late president wa Mutharika personal accounts at some commercial banks from as low as K1 million (about $4 000) to as high as K10 million (about $40 000) at a time. Among others, Mota-Engil made the cheque deposits into the late president’s personal bank account number 0140001886701 at Capital City Branch of Standard Bank. One cheque worth K10 million was deposited into Mutharika’s Standard Bank account number 0140001886701 on March 3 2010. On the deposit slip, the depositor only identified himself as Mota-Engil, but the signature is the same as the one on an FMB cheque number 9480 belonging to Mota-Engil. The other signature on the three cheques is for managing director Antonmarco Zorzi. The other two cheques are numbered 12570 (worth K2.5 million) and 12571 (worth K1 million). These cheques were written on March 24 2011. Kalua, who is Rumphi East MP (PP), said Parliament, as an oversight body, said they will push for the beneficiaries of the Mutharika estate to pay back to Malawians if the probe found the late president wrongly enriched himself. Justice Minister Samuel Tembenu claimed that no evidence of offshore accounts existed, adding that the accusations should be dismissed. The ruling DPP has since failed to disclosed how much the late president managed to accumulate while in office. When he ascended to the presidency in 2004 late Mutharika declared his total assets to be around one million US dollars (MK150m) in assets both in Malawi and Zimbabwe. Mutharika deposited the records with Parliament in August, 2004. After seven years at the helm of government, he was a proud owner of farms in Kasungu, Salima, Mitundu- Bunda, and the most famed glamorous Ndata Estate. This is apart from real estates in Lilongwe and Blantyre including one brought from former president Bakili Muluzi. Mutharika reportedly also owned a hotel, a villa and a yatch in Portugal. He was also founder and chairman of the Bineth Trust and the Bingu Silvergrey Foundation. He is also the founder of the Malawi University of Science and Technology on his Ndata estate land. ingodikirani kuti dpp idzacchoke mmboma, pakali pano sizingatheke. IT IS VRY DIFFICULT TO PROBE BINGU’SCWEALTH WHILE THE BROTHER IS ON THE SIT, BUT MSY BE TIME WLL COME , AKAZASANKHIDWA MUTSOGOLERICOCOKERA KWA MULUNGU NOT AS OF NOW .CHIEF INTERIJENCY WILL FOLLOW UCIF U DO THIS & YESS U CAN BE KILLED ; SO WAIT TIME WLL COME BINGUS WEALTH WLL BE TAKEN BACK TO GOVERNMENT , ITS AMATTER OF TIME MALAWI IS USED TO BE RULED BY FOREIGNERS INCTHE NAME OF BEING PROFESORS WHY GOD WHY?